The anatomy and structure of the adult human lens. The ocular lens is part of the anterior segment of the eye that, together with the cornea, provides the refractive power of the eye. 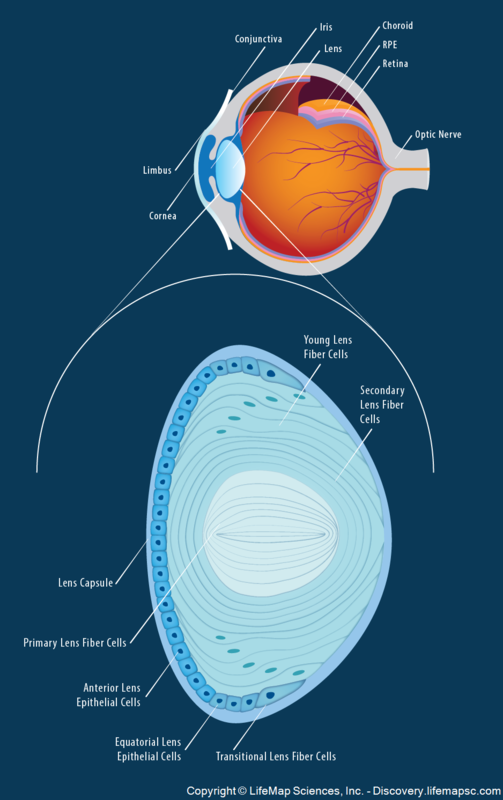 The mature lens is composed of a core of primary lens fiber cells (LFCs), layers of secondary lens fiber cells surrounding the primary LFCs and one layer of anterior lens epithelial cells, which covers the anterior surface of the lens. The lens capsule is an elastic membrane surrounding the ocular lens. Throughout life, the lens epithelium located in the peripheral lens (“germinative zone”) differentiates to secondary lens fibers. In the equator lens epithelium (the transitional zone between the lens epithelium and lens fiber cells), equator lens epithelial cells undergo cell cycle exit, migration and elongation into secondary lens fiber cells.